Gsellmann Wohnen - is located in the center of Gols, a picturesque town surrounded by romantic vineyards and pristine nature. 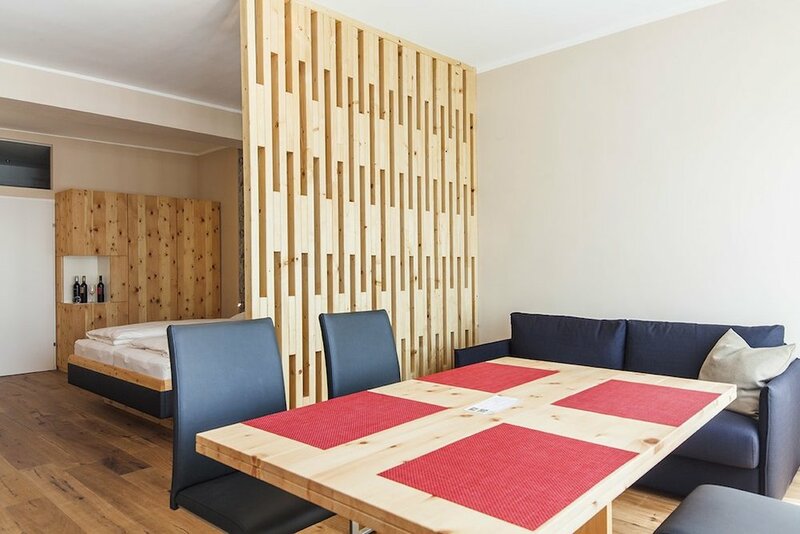 Our apartments are an excellent base for touring and exploring the famous wine region around Lake Neusiedl in the Burgenland. Relax in one of our 4 spacious and exclusively furnished apartments with fully equipped kitchen, dining area and modern bathroom. Enjoy a glass of wine on the tranquil roof terrace or in the romantic garden. A wheelchair friendly and accessible apartment is also available. This 48m² sized studio is wheelchair accessible. Comfortably furnished, with furniture from pinewood, high-quality boxspring beds, pull-out sofa, dining table in leather look, the kitchen is equipped with a dishwasher, refrigerator and a microwave oven; Bathroom and Toilet are separated; Bath and hand towels, hair dryer, cosmetic mirror, free Wifi, flat screen. This room is wheelchair accessible and can meet accessibility requirements for your stay. A studio of 43m², comfortably furnished, with oak furniture, high-quality boxspring beds, pull-out sofa, dining table in leather look, the kitchen is equipped with a refrigerator and a microwave oven; Shower and toilet; Bath and hand towels, hair dryer, cosmetic mirror, free WIFI, flat screen. Dogs are welcome in this apartment. Dog treats, dog fouling bag, drinking and food bowl are available. A youthful, romantic suite (28m² in size) in a charming walnut finish with a high-quality boxspring bed with light effects, the kitchen is equipped with a refrigerator and a microwave oven; Shower and toilet; Bath and hand towels, hair dryer, cosmetic mirror. Free WIFI and flat-screen TV. This studio is 38m². comfortably furnished, with beech wood furniture, high-quality boxspring beds, pull-out sofa, dining table, the kitchen is equipped with a dishwasher, a refrigerator and a microwave oven; Shower and toilet; Bath and hand towels, hair dryer, cosmetic mirror, free WIFI, flat screen. High chair, and toilet seat for kids, children's bed. This apartment is very suitable for families with children.